This section covers accessing, using, modyfing and deleting login keys. Login keys are alternative passwords for your account with special functions, such as expire time, access control, uses count and allowed IP(s). 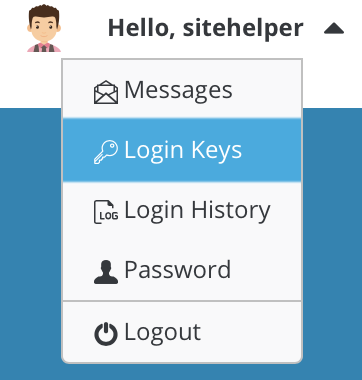 To access Login Keys, sign into the control panel and then click on the "Hello, [Login-Name]" link, followed by the "Login Keys" link. Note: If you don't see "Login Keys" key, then it's disabled by your administrator. Contact your Administrator to access Login Keys. In Login Keys page you should see empty login keys list. In order to create Login Key, click "Create" button. Key Value: Key value is actual key itself - alternative password for your username. We strongly recommend you to use "Random" function as it generates stong random string which is very hard to brute-force. Expires On: You can set precise expire date of your login keys, or you can choose keys never to expire. Uses: You can set number of requests allowed with this key. Note that requests is not login counts. Every time you access anything on control panel (exapmle: click on view users) request will be used. Clear Key: Automatically delete the key once the key expires, or all uses are used. Allow HTM: Allows browsing of the DA interface to HTML, iMG and CSS files. Commands: You can choose which specific commands can be accessed using login key. If none of commands selected, all will be allowed. Allowed IPs: You can choose which IP to allow connect with login key. Each IP must be written in new line. If none of the ip is written, all IPs will be allowed. Current Password: Enter currenct password and press "Create" button. You can view log of each request sent by user using login keys. You will see Date, IP, Command and Status. To access log, click "View" button next to Login Key column "Log".